Angel Food Cake with Lemon Cream + 5 Angel Food Cakes Recipes You Should Try! Our sweet baby boy, Nate, surprised us all and arrived 2 weeks early. Like his big sister, he arrived just before another major snow storm hit Boston. Everything went smoothly, but it is hard to believe he is finally here. We are now a family of five. C and G are in love; Bubba and I are slowly adjusting to life with three kids. Alice, our fury fourth, seems to have this expression on her face that says: really? another one? Bubba will be home with us for the next month, which will make this transition so much easier. I can’t imagine getting through this with anyone else. The kids love to have daddy home all the time and I am so grateful for the help. Shortly, after arriving home, G asked me to make something. Really? I just gave birth. I am so tired. I can’t do this now. C chimed in, “something sweet mama.” I needed to rest and recover, but they needed me again. They need mama, even if, mama just had another baby. So, I decided to make an angel food cake with a lemon whipped cream. The kids and Bubba love angel food cake and the lemon whipped cream seemed like the perfect topping to brighten our winter palettes. The cake and cream came together fairly quickly. Nate interrupted me a couple of times to nurse, but that is my reality, at least for now. It is ok. It passes by so fast. That saying “the days are long but the years are short” is so, so true. I remind myself of this when I up at 2am and then again at 4am. I used Ina Garten’s lemon angel food cake recipe and adapted it only by omitting the lemon zest. Her recipe is by far the best angel food cake recipe I have tried. The cake comes out moist and airy. It is not overly sweet like many of the store-bought versions. The lemon whipped cream recipe is from Martha Stewart. I did not alter her recipe because it is perfect. Her whipped cream has the right amount of lemon flavor and sweetness. The only thing I wish I added was fresh berries but I didn’t have any in the house. Next time! Come summer when berries are abundant, I will make this again. Ok got to get back to my 3 goosies. In a medium bowl combine 1/2 cup of the sugar with the flour. Sift together 4 times and set aside. Place the egg whites, salt, and cream of tartar in the bowl of an electric mixer fitted with a whisk attachment and beat on high-speed for about 1 minute or until the egg whites make medium firm peaks. Reduce the speed to medium and add the remaining 1 1/2 cups of sugar by sprinkling it over the beaten egg whites. Beat for a few minutes until thick and shiny. Add the vanilla and continue to whisk for about 1 more minute or until thick. Sift about 1/4 of the flour mixture over the egg whites and fold it into the batter with a rubber spatula. Keep adding the sifted flour by fourths and folding until it’s all incorporated. Pour the batter into an ungreased 10-inch tube pan. Smooth the top, and bake it for about 35 to 40 minutes or until it springs back. Remove the cake from the oven and invert the pan on a cooling rack. Allow to cool completelyy. Remove from the pan and serve at room temperature with lemon cream and fresh berries if you have them. Cake will last, well wrapped, at room temperature for several days. Enjoy! Whisk lemon juice, sugar, flour, and salt in a saucepan over medium-high heat. Bring mixture to a boil and whisk constantly for 1 minute or until it thickens. Transfer it to a heat proof bowl set in ice-water bath to cool completely. Stir occasionally. Whisk chilled cream in a mixer on medium speed until stiff peaks form, about 3 minutes or so. Gently fold whipped cream into juice mixture in thirds. Add the lemon zest and gently fold to combine. Refrigerate the lemon cream until ready to serve or up to overnight. Enjoy! 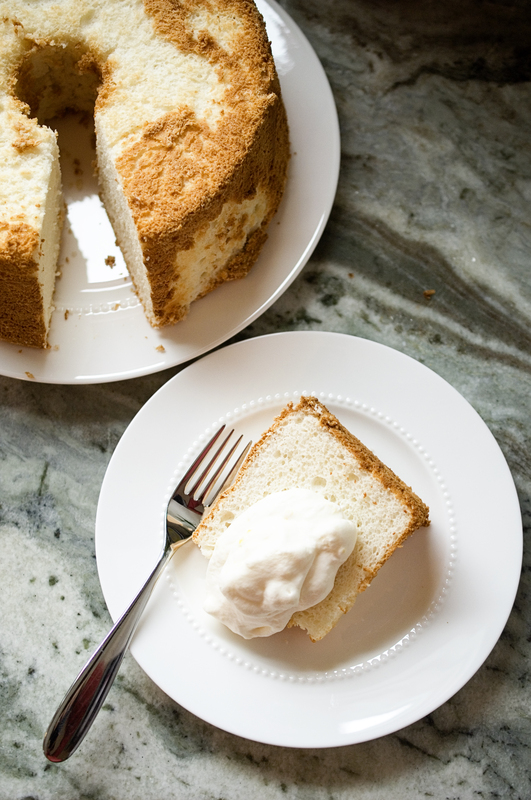 5 Angel Food Cake Recipes You Should Try! I love cupcakes. In fact I am a bit obsessed with cupcakes. I think I may need to try this recipe for angel food cupcakes very soon. If you love chocolate and angel food cake, try this recipe for chocolate angel food cake with fruit and maple yogurt. Yum! Like all of us, I am tired of winter. My thoughts turn toward spring and summer. Just the picture of this red, white and blueberry trifle from the blog Skinny Taste makes me happy. I can’t wait to try it this summer! Angel food cake for breakfast? Yes please! How Sweet It Is has the recipe for angel food cake french toast. Give it a shot this weekend. Now, what to do with the leftover egg yolks? Babble has a list of 24 ways to use up leftover egg yolks and egg whites. Check it out! This entry was posted in Cakes, Sweets and tagged angel food cake, angel food cake with lemon cream, healthy dessert, lemon cream. Bookmark the permalink.